As component technology progresses, internal device sizes reduce and become more ESD sensitive. If two objects with different voltages are close enough to touch charge may pass from one object to the other in a rapid electrostatic discharge, damaging the sensitive components. In manufacturing processes, the people are likely to be the greatest generators of ESD. 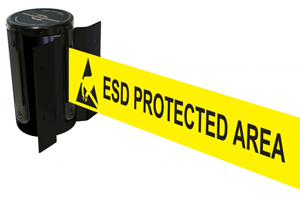 We are increasingly being asked by customers to integrate electronics into injection moulded assemblies and in recognition of the growth in this side of our business and the necessity to protect electronic components from electrostatic discharge Inoplas maintains a dedicated ESD controlled cell. In this area we have installed ESD flooring, benches, soldering stations, gluing stations, fume extraction and general assembly areas. The suite has an ESD wrist and heel strap test on entry and all materials entering or leaving the room must be in anti-static containers. This room allows us to solder wires, cables, components and perform any additional work needed to a customer's circuit where it is essential to protect the components from electrostatic discharge prior to moulding. The ESD sensitive parts are stored and transported in antistatic containers and these good practises continue throughout the moulding process. Fully equipping our ESD cell was a significant investment for us as we continue to extend and improve our capabilities.